Description: Kostica, 42, from Romania, is giving the final touches to the just erected new wall inside the Wildwood Road mansion, on Sunday, July 1, 2007, in Hampstead, London, England. Situated opposite Hampstead Heath, North London's green jewel the average price for properties on this road reaches ? 2,500,000. Million Dollar Squatters is a documentary project in the lives of a peculiar group of squatters residing in three multi-million mansions in one of the classiest residential neighbourhoods of London, Hampstead Garden. The squatters' enthusiasm, their constant efforts to look after what has become their home, their ingenuity and adventurous spirit have all inspired me throughout the days and nights spent at their side. Between the fantasy world of exclusive Britain and the reality of squatting in London, I have been a witness to their unique story. While more than 100.000 properties in London still lay empty to this day, squatting provides a valid, and lawful alternative to paying Europe's most expensive rent prices, as well as offering the challenge of an adventurous lifestyle in the capital. 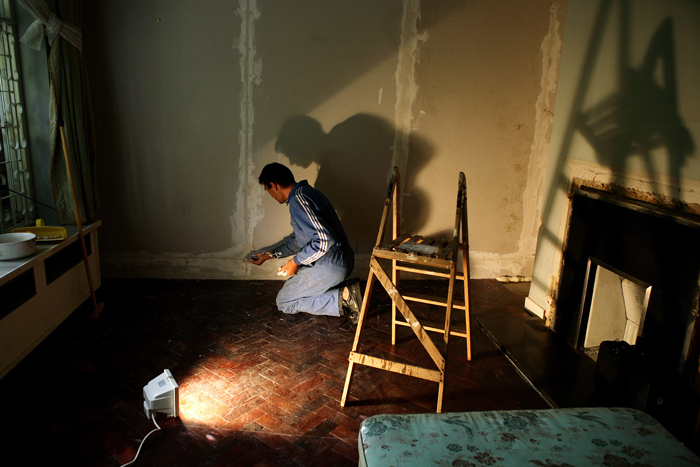 Caption: Kostica, 42, from Romania, is giving the final touches to the just erected new wall inside the Wildwood Road mansion, on Sunday, July 1, 2007, in Hampstead, London, England. Situated opposite Hampstead Heath, North London's green jewel the average price for properties on this road reaches £ 2,500,000. Million Dollar Squatters is a documentary project in the lives of a peculiar group of squatters residing in three multi-million mansions in one of the classiest residential neighbourhoods of London, Hampstead Garden. The squatters' enthusiasm, their constant efforts to look after what has become their home, their ingenuity and adventurous spirit have all inspired me throughout the days and nights spent at their side. Between the fantasy world of exclusive Britain and the reality of squatting in London, I have been a witness to their unique story. While more than 100.000 properties in London still lay empty to this day, squatting provides a valid, and lawful alternative to paying Europe's most expensive rent prices, as well as offering the challenge of an adventurous lifestyle in the capital.